Holiday on the Bauernhof Reschen farmWelcome to the countryside!Altitude: 743 m above sea levelOur farm and inn is located on the way from lake Traunsee to the Gasberg mountain. Embedded in a gentle and peaceful landscape with magnificent views of the Hollengebirge mountain range, our newly built south-facing apartment provides the perfect environment for a holiday for 2 up to 4 people. In our modern stable, you can find 12 cattle, ranging from calves to bulls. If you want, you can help us in the stable. Our little guests love to play on our private playground which also features a little hut. An idyllic footpath leads up to our forest hut which is the perfect place to escape the hustle and bustle of everyday life and to let one's thoughts wander. The Ferienregion Traunsee holiday region organizes a myriad of events throughout the year. Furthermore, the Salzkammergut region perfectly lends itself to a great number of activities, such as hiking, biking, mountain climbing, sailing, swimming and much more. In our inn, we pamper our guests with traditional and seasonal specialties. RATES:Apartment, sleeping 2 - 4 persons: 60 m²Off-peak season:Apartment f. 2 pers. 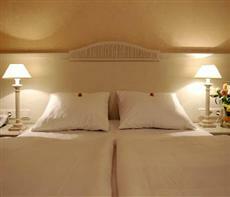 EUR 60 per night + EUR 10 for each extra personPeak season (Jul 1 - Aug 31, Christmas + New Year's week):Apartment f. 2 pers. EUR 65 per night + EUR 10 for each extra personEnd-of-stay cleaning: EUR 20Kids up to 6 years stay for free!